Through my voice speaks the Zapatista Army for National Liberation. Greetings to everyone, to all[iii] who are present and those who are not, from the Zapatista men, women, children, and elderly. We warmly welcome the step, the voice, the ear, the gaze, and the collective heart of those below and to the left. We have here as our guests of honor the families of those students who are missed in Ayotzinapa, in Mexico, and in the world. We are truly grateful for the honor that that they have done us by being here with our Zapatista communities. Their silences and words also honor us. Their pain and rage make us brothers. We Zapatistas have not closed our eyes or ears to the sorrow and courage that the families of Ayotzinapa show us and tell us: sorrow for the dead and disappeared; courage in the face of the bad governments who hide truth and deny justice. What we know and are reminded of by the Ayotzinapa struggle is that it is only as organized communities that will we find the truth. Not only the truth that has been disappeared in Ayotzinapa, but also all of the truths that have been kidnapped, imprisoned, and murdered in every corner of planet Earth. It is upon this missing truth that we can build justice. 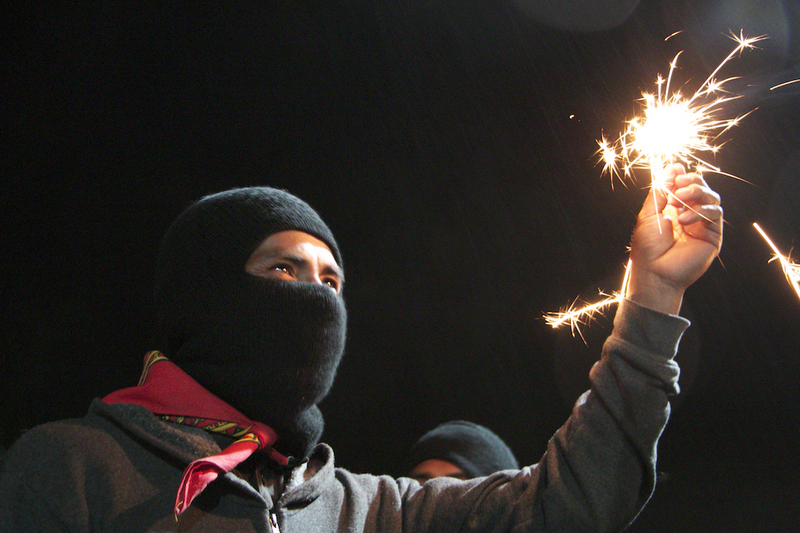 We Zapatistas believe that trust must no longer be placed in the bad governments that exist all over the world. These bad governments only serve the big capitalists. These bad governments are merely the employees of capital. They are the managers, foremen, and overseers of the great capitalist plantation. These bad governments will never do a single good thing for the people. Anything that they might say to the contrary is irrelevant, because these governments aren’t the ones in charge; the only Boss is neoliberal capitalism. That is why must not believe anything that these bad governments say. Everything that we want as peoples we have to build for ourselves. Just like the families of the murdered and disappeared students from Ayotzinapa are building their own search for truth and justice. Just like they are building their own struggle. We want to tell the fathers and mothers of the disappeared compañeros not to tire in their struggle, not to stop struggling for the truth and for justice for the 43. The struggle of the families of Ayotzinapa is an example that nourishes all of us who seek truth and justice in all lands across the planet. We want to follow the example of the fathers and mothers who left their homes and their families to work and to meet with other families who have the same pain, rage, and resistances. But, what struggle are they talking about? We know that what they really want is to get into Power and that once they manage to do that, they forget about everything and everyone else. That it is why it makes more sense for us to follow the example of the families from Ayotzinapa and organize ourselves. We have to build and organization and make it grow in every place where we live. We must imagine how a new society might be. But in order to do this we have to study how things are for us in the society that we live in now. We Zapatistas would say that we are living in a society where we have been exploited, repressed, disdained, and displaced by centuries of bosses and leaders, and that this situation continues in society even today, at the end of 2014 and the beginning of 2015. And all that time they have tried to deceive us, telling us that they, those above, are the best and that we aren’t worth anything. They tell us that we are fools. They tell us that they are the ones who know how to think, imagine, and create, and that we are just peons carrying out their tasks. “To hell with that!” “Enough is Enough!” we Zapatistas said in the year 1994. And ever since we have had to govern ourselves autonomously. That is how we Zapatistas see things, that the work and struggle of rebellion and resistance carried out with dignity by families of the disappeared student compañeros calls us to organize ourselves so that the same thing doesn’t happen to us. Or so that we know what to do before the same thing happens to us. Or what to do so that what happened to them in this system can never happen to anyone else. The families of Ayotzinapa have explained the situation very well. Like good teachers, they have explained that the system itself is responsible for this crime, working through its managers. And this system also has schools for its managers, foremen, and overseers; these schools are the political parties that only seek office for themselves, job titles and petty posts. That is where they train the servile managers of the bad governments, where those servants learn to rob, to deceive, to impose, and to command. That is where they train those who make the laws, that is, the legislators. That is where they train those who use violence to force us to follow those laws, that is, high-level, mid-level and low-level leaders, with their armies and police forces. That is where they train those who judge and condemn anyone who doesn’t obey those laws, that is, the judges. The way we see it, it doesn’t matter whether these managers, foremen, and overseers are men or women, or if they are white, black, yellow, red, green, blue, brown, or any other color. The work of those above is to stop those of us below from being able to breathe. And sometimes they have the same color skin as those they order to be killed. Sometimes the killer and the victim have the same color and the same language. And here neither calendar nor geography matter. What the struggle of the families and compañeros from Ayotzinapa has made us realize is that those who kidnap, murder, and lie are all the same. That those who preach lies will not seek the truth. That those who impose injustice will not bring justice. And we think that things cannot continue like this, everywhere and on every level. That is what the families of Ayotzinapa teach us, that we must seek out and encounter others who suffer this illness called capitalism. Hand in hand with the families of Ayotzinapa, we look for the disappeared from all of the worlds that we are. Because what is murdered and disappeared every day, every hour, and everywhere is truth and justice. Hand in hand with the families of the 43, we understand that Ayotzinapa is not located in the Mexican state of Guerrero, but everywhere below. Through them we understand that the common enemy of both the countryside and the city is capitalism, not only in one country but everywhere in the world. But this capitalist world war encounters at every turn and in every corner people who rebel and resist. In rebellion and resistance these people organize themselves according to their own ways of thinking, their own place of struggle, their own distinctive histories, and their own ways of being. And in their struggles of resistance and rebellion, they get to know one another and make agreements to achieve what is needed. They get to know each other, but they do not judge each other. They don’t compete with each other to see who is better. They don’t ask who has done more, who is ahead, who is the vanguard, or who gives the orders. What they question among themselves is whether capitalism does anything that is good. And the answer that they come to is NO, there isn’t a single good thing. On the contrary, capitalism has wronged us a thousand ways, and so it is logical that we have a thousand ways to respond. So the question becomes, how do we rebel against evil? How do we resist so that this evil of capitalism doesn’t destroy more? How can we reconstruct what has been destroyed and make it even better than it was before? How do we raise those who have fallen? How do we find the disappeared? How do we free the prisoners? How do the dead live? How are democracy, justice, and freedom constructed? There is no single answer. There is no manual. There is no dogma. There is no creed. There are many answers, many ways and many forms. And each of us will see what we are able to do and learn from our own struggle and from other struggles. While those above enrich themselves with money, those below enrich themselves with the experience of struggle. And, sisters and brothers, we want to tell you clearly what we Zapatistas have learned from looking and listening to ourselves, and from looking and listening to the world. It has never been nor will it ever be an individual who will give us the gift of liberty, truth, and justice. Because it turns out, friends and enemies, that liberty, truth, and justice are not gifts, but rights that we have to attain and defend. And it is the collectives who manage to do this. It is us, the communities, women, men and others [iv] from the countryside and the city, who have to create liberty, democracy, and justice in order to make a new society. This is what the fathers and mothers of the disappeared are telling us. We will have to struggle in a thousand different ways to achieve this new society. With varying levels of commitment, we will have to participate in creating this new society. We all must accompany the families of Ayotzinapa in their struggle to find truth and justice, because this, plain and simple, is the duty of anyone below and to the left. And we say accompany because this is not about directing them, manipulating them, managing them, using them, or degrading them. We must struggle together with them. Because no honest human being could celebrate this pain and this rage, this injustice. The Zapatista men and women support you because your struggle is just and true. Because your struggle should be that of all of humanity. It has been you and no one else who has put the word “Ayotzinapa” into the world’s vocabulary. It has been you, with your simple word; you, with no boss other than your suffering and enraged heart. And this has given much strength and encouragement to common people below and to the left. Because out there they say, they yell, that only the big heads [highly educated] know how to do things, that things can only be done through leaders and bosses, through political parties, through elections. And because they are yelling, they cannot even hear each other, much less the truth. And then your pain appeared, and your rage. And you taught us what was and is our pain, and what was and is our rage. That is why we asked you to take our place during these days of the First World Festival of Resistance and Rebellion Against Capitalism. We not only hope that you achieve the noble objective for the missing students to be returned alive; we also will continue to support you with our small strength. As Zapatistas, we are sure that when your missing ones, who are also ours, are once again present, they will be impressed, but not so much by the fact that their names have been taken up in so many tongues and so many geographies. Not because their faces have been seen all over the world. Nor because the struggle for them to be returned alive was and is global. Nor because their absence has exposed the lie that is called government and denounced the terror that is the system. Yes, they will marvel, but it will be because of the moral stature of their families, of you, who did not for a single moment allow their names to be forgotten. And who, without giving in, without giving up, without selling out, kept looking until you found them. And so, when this day or night comes, your missing ones will give you the same embrace that we Zapatistas now give to you. It is an embrace of caring, respect, and admiration. And in addition, we give you 46 embraces, one for each of those who are absent from your lives. – Emiliano Alen Gaspar de la Cruz. Here with us are the brothers and sisters from the native peoples who have come together in that great agreement that is called the National Indigenous Congress. For more than 500 years, we have searched for each other as originary peoples along the paths of rebellion and resistance. For more than 500 years, pain and rage have been present along this path, day and night. For more than 500 years, we have sought liberty, truth, and justice. For more than 18 years, we have come together as the National Indigenous Congress, thanks to the work of the now deceased Comandanta Ramona. Since then we have tried to be students of her wisdom, her story, her determination. Since then, together we have slowly unveiled the gallop of capitalism’s macabre chariot over our bones, our blood, our history. And we named exploitation, dispossession, repression, and discrimination. And we named the crime and the criminal: the capitalist system. But that is not all; with our bones, our blood, and our history we also gave name to the rebellion and resistance of the originary peoples. With the National Indigenous Congress, we raise up the dignified color of the earth that we are. With the National Indigenous Congress, we have learned that we need to learn to respect each other and that each of us will have a place within our demands. We understand that right now, truth and justice for Ayotzinapa is the most urgent demand. Today, the most painful and infuriating thing is that the 43 are not with us. We do not want the same thing to happen to us tomorrow, and so let us reach out beyond our peoples, our nations, our neighborhoods and tribes. Let us call on our peoples to no longer allow ourselves to be fooled with miserable crumbs meant to keep us quiet while the Rulers continue to enrich themselves on our backs. Let us unite our rage and organize and struggle for our political prisoners with dignity, without selling out, without giving up, without giving in. We must do this for those who are in prison for struggling against the injustices we face. As originary peoples we fight for what is our collective right—a fight that we learned from our great-great-grandparents who did not allow themselves to be destroyed as the originary peoples of these lands we are from. This is why we exist in so many languages —because our ancestors knew how not to be defeated. And now it is our turn to do the same. All of us must say NO to the transnational corporations. From our communities, our nations, our neighborhoods, and our tribes, we must all think about what we are going to do, how we are going to do it; we have to think about how we are going to communicate to each other everything that the bad governments do to us. We will have to organize ourselves and take care of each other. Because they are going to want to buy us off; they are going to offer us crumbs; they are going to offer us petty job postings. They are going to try every possible way to divide us and get us to fight each other and kill each other off. They are going to want to dominate and control us with other ideas. They are going to spy on us and unleash every type of fear inside of us. And they are going to set a thousand traps so that we falter and stop fighting for our people. But are we really going to allow them to treat us like their trash for another 520 years? We only want to live in peace, without the exploitation of man by man. We want equality between men and women, respect for difference, and the ability to decide our destiny, the kind of world that we want for the countryside and the city. We are certain that we will know a better way to live than the way that they impose upon us. We Zapatistas want to ask the original peoples of the National Indigenous Congress to embrace the families of Ayotzinapa by welcoming them in their territories. We ask that they invite these families to visit them on their paths and with their hearts. We ask them to extend to these families the honor of their word and their ear. The wisdom that lives in the heart of the original peoples is great, and it will grow even more by sharing their words of pain and rage with these families. As guardians of the mother earth, we know well that our path is long and that it needs accompaniment. There is still so far to walk and we cannot afford to stop. So we will continue moving forward. As original peoples, we know mother earth well; we work the earth and live from what she gives us without exploiting her. Let us care for her, love her, and rest in peace within her. We are the guardians of the mother earth. With her, we can do anything; without her, everything dies uselessly. As original peoples, our time is now and forever. During these days, together with those who are present and those who are not, a “sharing” [compartición] has taken place that is just one more step that we must take together as the Sixth, each in their own place of struggle, in their own way, within their own distinctive history. There are times when, as history unfolds, it places us in front of us something that unites us, no matter the geography in which our dreams take place, no matter the calendar of our struggle. Ayotzinapa has become a point that has united us. Let us work, organize, and struggle for our disappeared compañer@s and for our prisoners. Let us form a whirlwind across the world so that they return our disappeared to us alive. Let us become one, for as human beings we are indeed one, although there are some beasts among us that disappear us; they are the capitalists. Let us form one single wave, envelop those beasts and drown the bastards who have done us so much harm all over the world. Let us value ourselves, as the families of Ayotzinapa are teaching us. Let us do this without ceasing, as they do, without taking advantage of the situation for other gains or interests. Let us think instead about its positive connotations, and take advantage of our common wealth. We have already suffered the evil of those who take advantage to exploit us. And they still disappear us, torture us and imprison us. Now is the time for us, the world’s poor, to begin building another world that is more just, where we leave future generations prepared to prevent the return of the savage neoliberal capitalist. Let us join our struggles, the struggle for the disappeared. Let us name those who are absent. Let us clearly point to the crime; let us clearly point to the criminal. The families of Ayotzinapa have fueled our strength of rebellion and resistance; they have opened our eyes even more and they have grown our dignified rage. They are pointing out a path and telling us that they are willing to give their lives if necessary for their disappeared loved ones. And they also show us that all of us, whether or not we have disappeared loved ones, must be organized. Because we will all have disappeared loved ones if we do not organize ourselves, since the narco-government continues to exist. They show us that we must struggle, that it does not matter if they talk about us in the paid media; what matters is life and that the deaths and disappearances cease. They show us that it is time for us to organize. That it is time for us to decide for ourselves what our destiny will be. And it is just that; at once simple and complicated. This requires organization, work, struggle, rebellion, and resistance. Only with movement and organization can those of us below defend and liberate ourselves. The war against our desire for peace continues. The Ruler still seeks to extinguish our freedom. The lies that try to hide our true work persist. Our blood and our death continue to fertilize our mountains. And as it has been for a while now, the pain and death once reserved only for us continue extending their reach to others,[vi] both in the countryside and in the city. Darkness becomes longer and heavier across the world, touching everyone. We knew it would be like this. We know it will be like this. We spent years, decades, centuries preparing ourselves. Our gaze is not limited to what is close by. It does not see only today, nor only our own lands. Our gaze extends far in calendar and geography, and that determines how we think. Each time something happens, it unites us in pain, but also in rage. Because now, as for some time already, we see lights being lit in many corners. They are lights of rebellion and resistance. Sometimes they are small, like ours. Sometimes they are only a spark that quickly goes out. Sometimes they go on and on without losing their glow in our memory. And in all of these lights there is a wager that tomorrow will be very other. We knew this 21 years ago, 31 years ago, 100 years ago, 500 years ago. We know it now, that we have to struggle every day, every hour, everywhere. We know that we will not give up, that we will not sell out, that we will not give in. We know, and we are sure, that what is missing is yet to come. In the upcoming days, weeks, and months, we will share more of our word and our thought on how we see the world that is small and the world that is big. These words and thoughts will be complicated because they are so simple. We see clearly that the world today is not the world of 100 years ago; indeed, it is not even the world of 20 years ago. As Zapatistas, small though we are, we think about the world. We study it in its calendars and geographies. Critical thinking is necessary for the struggle. Critical thinking they refer to as theory. We say no to lazy thinking that conforms itself to whatever exists. No to dogmatic thinking that tries to become Rule and impose itself. No to trickery that argues by using lies. We say yes to the type of thinking that asks, that questions, that doubts. Not even in the most difficult conditions should the study and analysis of reality be abandoned. Study and analysis are also weapons of struggle. But neither practice by itself, nor theory by itself is enough. Thinking that does not struggle does nothing but make noise. A struggle that does not think repeats its mistakes and does not get up after it falls. Struggle and thinking unite in those who are warriors, in the rebellion and resistance that today shake the world, even if their sound is one of silence. We Zapatistas think and struggle. We struggle and think within the collective heart that we are. There is not just one path. There is not one kind of step. Those who walk and struggle do not all do so the same way. There is not just one who walks. The times and the places below and to the left on painful lands are diverse, and there many colors shine. But the destination is the same: freedom. Freedom. FREEDOM. TRUTH AND JUSTICE FOR AYOTZINAPA! TRUTH AND JUSTICE FOR MEXICO AND FOR THE WORLD! DEATH TO THE DEATH IMPOSED BY CAPITALISM! LONG LIVE THE LIFE CREATED BY RESISTANCE! FOR HUMANITY AND AGAINST CAPITALISM! [i] Compañeroas is used to give a range of possible plural gendered pronouns including male, female, transgender and others. [ii] The EZLN’s civilian militia or reserves. [iii] The text uses “todas, todos, todoas” to give a range of possible plural gendered pronouns including male, female, transgender and others. [iv] The text uses “otroas” to give a range of possible plural gendered pronouns including male, female, transgender and others.